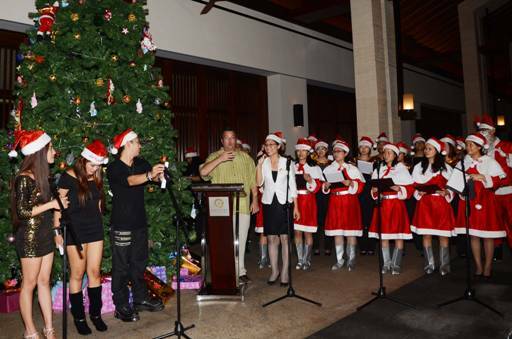 Mr. Nicolas C. Solari, the General Manager of Haitang Bay Gloria Sanya with the Christmas Choir Team for the Christmas Tree Lighting Ceremony. Haitang Bay Gloria Sanya held its first Christmas tree lighting ceremony on December 14th, 2012 at the hotel lobby. Hotel in-house guests were invited to this special evening; colorful Christmas decorations, traditional Christmas snacks, Christmas Choir Team, Santa Clause and gifts for the children present has made this special evening special, filled with joy and happiness. The highlight of the night was the lighting ceremony kicks off by the Hotel General Manager, Mr. Nicolas C. Solari, followed by the singing presentation of the hotel choir team with traditional Christmas song, gift and wishes from the Santa Claus and Santarina to all guests in the lobby. In conjunction with the special evening, hotel has set up a Christmas Donation Box for the Sanya Welfare Center, to invite hotel guests to extend and share the love and care for unfortunate kids of Sanya Welfare Center.